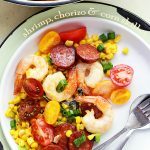 Shrimp, Chorizo and Corn Skillet – Easy one skillet meal packed with shrimp, tomatoes, corn and chorizo sausage. This. Is. So. Good. Doesn’t it look SO GOOD?! HEY! Hi! How do you do? Happy FriYAY! Which, in reality, it actually means that on this day we’re entitled to pizza, movies and a beer. I don’t do beer, but what the heck – the weekend is ah-comin’! Also, I’m here with some Friday goods because I want us to have a weekend that is equal parts productive, chill, and delicious. 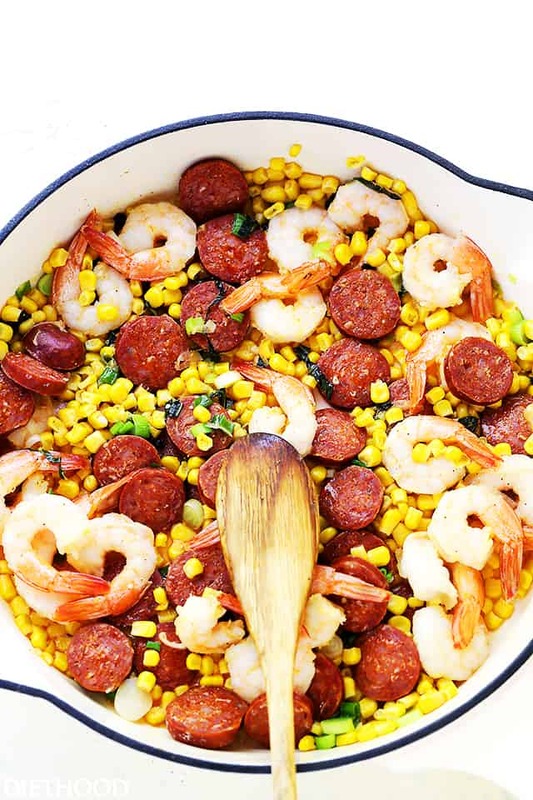 Meet my new summer OB.session; Shrimp, Chorizo and Corn Skillet. 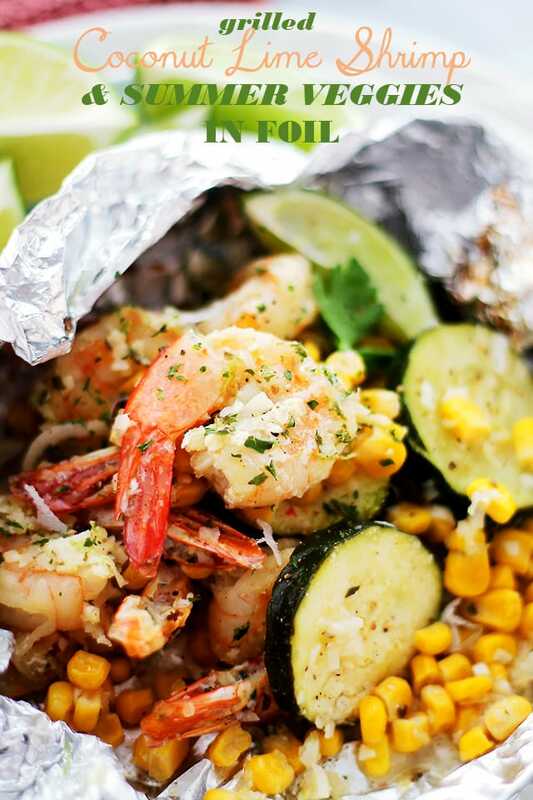 Sauteed, flavored, textured and possibly the easiest variation on the classic shrimp boil. Stepping in the kitchen to make any classic takes confidence and guts, usually inspired by a tremendous craving, nostalgia, and a grumbling stomach. 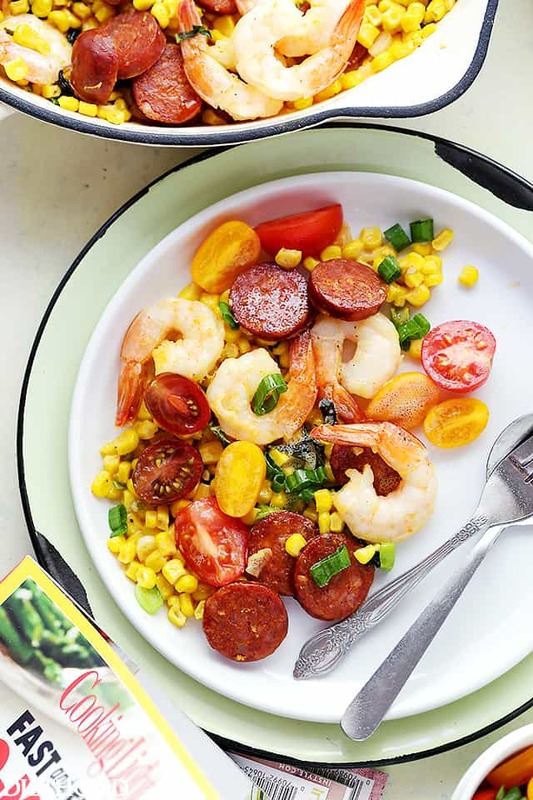 However, knowing that you don’t want to mess up said classic – AKA Shrimp Boil – you go in the easier way and toss it all in a skillet! Oh yes I did. It’s here and it’s delicious. I’m alllll over this thing. It’s rare for me to make the same meal more than once because, I am constantly making new things, especially for the blog, but this guy had me on my knees, asking for more. Say what! You don’t like seafood?! Well. This might totally change your mind. A bit time consuming and labor intensive… just kidding! Just looking at this picture brings back the total mouth party that this meal is. Prepping the ingredients takes less than 10 minutes, and dinner is on the table in about 20 minutes. Win Win. What is NOT a win-win is that this only fed my husband and I. It should have been enough for 4, buuuuuut, it was too good. In fact, it’s been our porch-meal thrice this month. 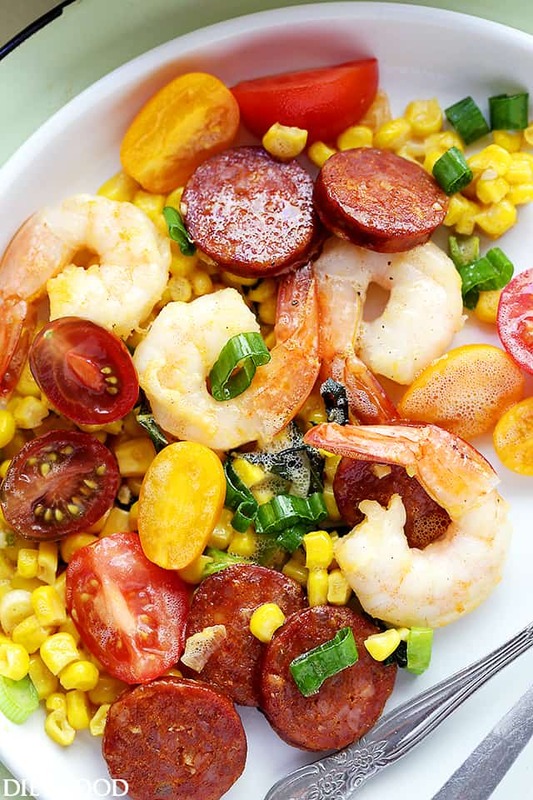 Shrimp, Chorizo and Corn Salad - Start your summer right with this amazing salad chock full of shrimp, tomatoes, corn and chorizo sausage. 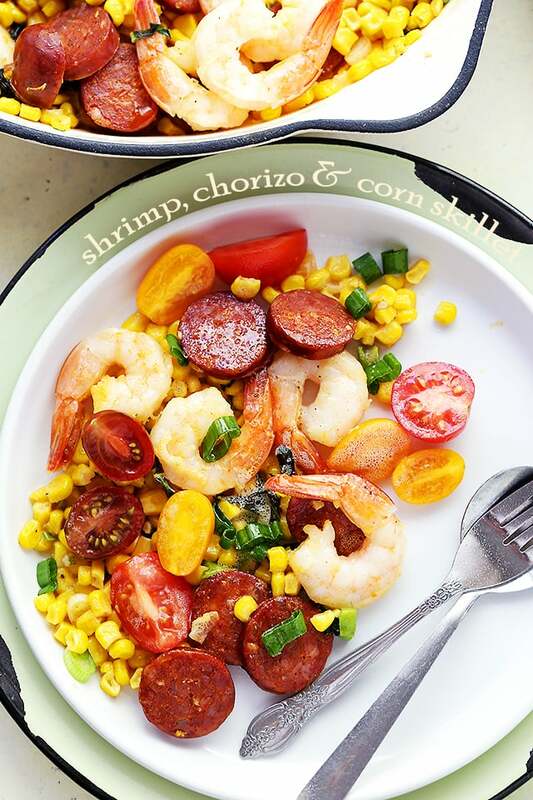 In a large bowl, combine shrimp, corn, green onions, sriracha, garlic, salt, and chorizo sausage. Add 1/4 cup chopped basil, 12 red tomato halves, and 12 yellow tomato halves; toss shrimp mixture gently to combine. Add shrimp mixture to pan and cook for 4 minutes or until shrimp turns pink, stirring frequently. Place about 1 1/2 cups shrimp mixture in each of 4 shallow bowls, and sprinkle each serving with 1/2 teaspoon grated lemon rind, 1 1/2 teaspoons lemon juice, 6 tomato halves, and 1 tablespoon chopped basil. Is the sausage already cooked? The recipe doesn’t mention cooking it. Just made this and had to tell you how wonderful it is. Delicious, fresh and easy! This recipe is a keeper! This looks like the perfect summer meal! I’m dying over this! I understand why you are obsessed. 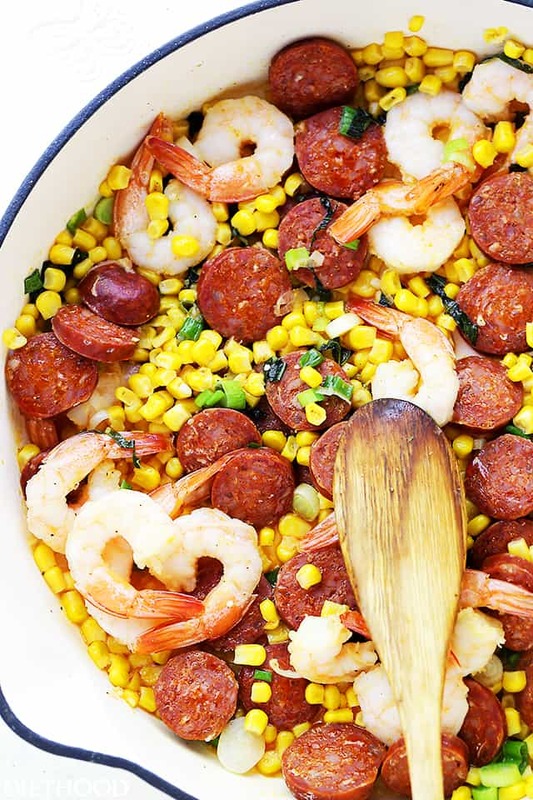 The combination of shrimp and sausage is always perfect. I can see shy you’re obsessed. I love this combination of seafood and sausage. Just delicious! 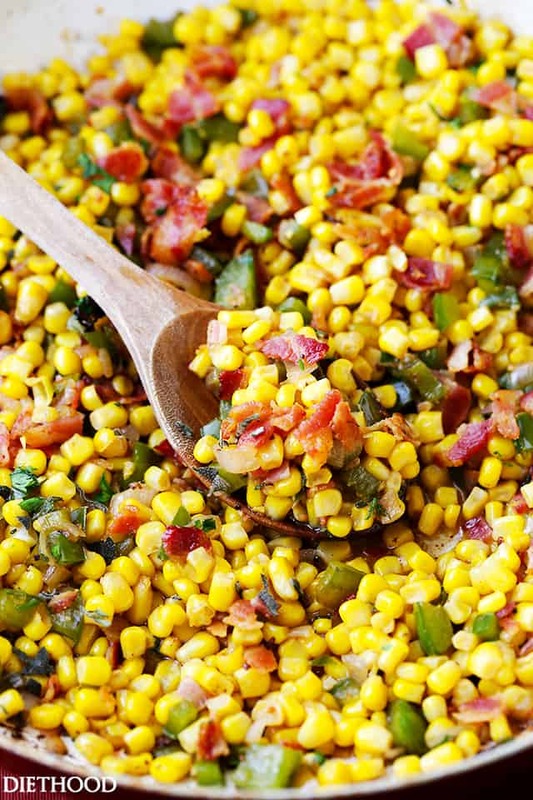 Ohh my gosh YES – so much flavor in there! This is totally my kind of meal. YES, that looks extremely good! And I want a big plate of it! !